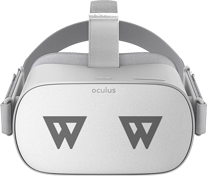 Wonda VR experiences can be viewed through the Wonda VR native app for Oculus Go. To have access to the app, please send an email to support@wondavr.com to request an Oculus Redeem Key. From your Oculus account, go to My Profile > Redeem Code and add your own Redeem Code which was sent to you by the Wonda VR support team. 2. Launch the Oculus Library using your Oculus GO Headset (be sure to be connected with the same Oculus account) and install the Wonda VR Studio app available in Library / Not Installed. The app will be then available in Library / My Apps. The app is now installed on your device and you can use it on all devices connected to your Oculus account. Copy the “publish-to-app” content (media folder, Your_project_name.wonda file and data.json file) from the computer to the Oculus Go's WONDA_VR_STUDIO folder (create one if it doesn’t exist). Launch the Wonda VR app from the Oculus Go library to launch the project locally. NB 1: After connecting your headset to your computer, you will need to allow access from within the Oculus Go to be able to access its files on your computer. NB 2: If your Oculus Go is in Developer Mode, you may not be able to access your files on your computer. You can turn Developer Mode on and off via the Oculus mobile app. NB 3: If the Oculus Go headsets are set-up using the same Oculus account, the Wonda VR app will already be available to download in the 'Not Installed' library after redeeming one code. Launch the Wonda VR Studio app from the Oculus Go library to launch the project online.